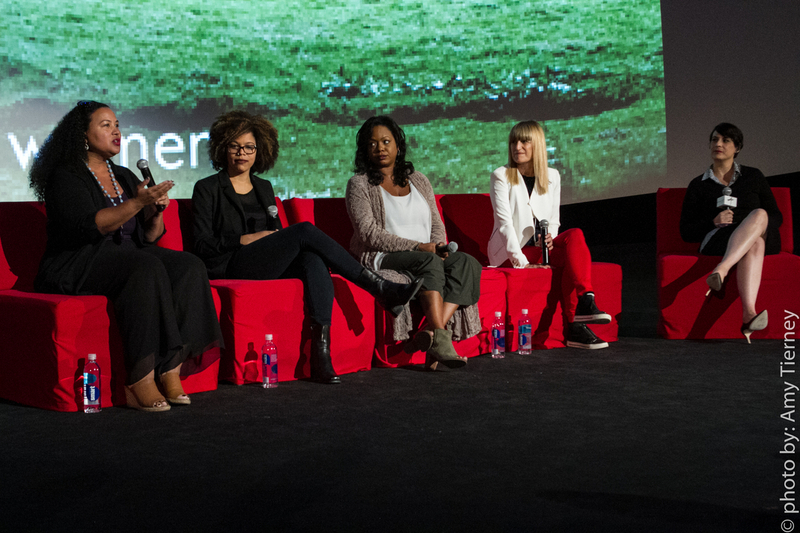 On November 5th hundreds of women sat in a theater at the Arclight in Hollywood for a day of inspiration and conversations about gender equality, empowerment and becoming a game-changer in the entertainment world. The Women in Entertainment inaugural summit was presented by Arclight in partnership with the Geena Davis Institute on Gender in Media and Women in Film hosted by Gretchen McCourt, EVP of Programming for Pacific Theaters. The panelists spoke on topics that allowed women to be open and honest about diversity and creating opportunities for themselves. “Diversity is not the right thing to do. It makes business sense. It makes dollars,” said Tiffany Smith-Anoa’I, SVP of Entertainment Diversity for CBS, as she sat on the Gender and Equality panel. Smith-Anoa’I went on to clarify that diversity doesn’t just stop at ‘black’ but should include different ages, sexual orientation, appearance and those with disabilities. She encouraged women to create those opportunities if no one is willing to open a door for them. In addition to creating their own opportunities, a reminder to help each other get to the next level was a common thread throughout the day. Lyn Paolo, Costume Designer for Scandal, spoke specifically on the importance of mentorship and women supporting each other. Keynote speakers Cathy Schulman, President of Women in Film, and Geena Davis both carried on this message. Davis who started her institute in 2006 is focusing on the lack of female directors and decision makers in the industry and how we can make a change. The day ended with more powerful panels like Digital Game Changers and Leveling the Playing Field. Lenee Breckenridge who is Director of Public Relations for Ultimate Fighting Championship, talked about her push to getting athlete Ronda Rousey on the cover of Sports Illustrated. Inspiration continued to dance amongst the audience as Beatriz Acevedo and Maiah Ocando of MiTu Networks encouraged women to pick up a camera and start their own youtube channel. It was a wonderful time to share victories and challenges amongst women in the entertainment industry and to discover how women impact the industry. An event this powerful will surely continue to grow.